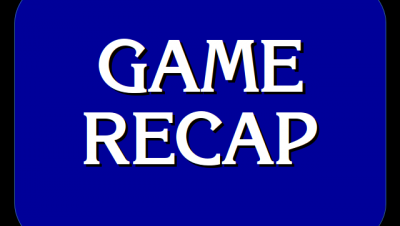 Today’s Final Jeopardy answer (in the category The Elements) and statistics for the Thursday, April 25, 2019 game between Alix Basden, Tim Hall, and 15-day champion James Holzhauer. 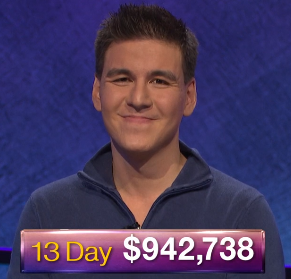 Today’s Final Jeopardy answer (in the category Geographic Nicknames) and statistics for the Wednesday, April 24, 2019 game between Wayne Erxleben, Silvija Ozols and 14-day champion James Holzhauer. Today’s Final Jeopardy answer (in the category American History) and statistics for the Tuesday, April 23, 2019 game between Kevin Donohue, Claudia Walters, and 13-day champion James Holzhauer. Today’s Final Jeopardy answer (in the category 19th Century Brits) and statistics for the Monday, April 22, 2019 game between Rebecca McNitt, Rob Hornick, and 12-day champion James Holzhauer. Today’s Final Jeopardy answer (in the category British Monarchs) and statistics for the Friday, April 19, 2019 game between Gabby McGregor, Nate Marks and 11-day champion James Holzhauer.